Our Crooked Branch: Sick "Bugs"
I'm home today with 1.5 sick kids. Addi has a fever, cough, runny nose and a whiny disposition. Sam has a runny nose and just looks yucky so I'll probably take her to the doc as well. And I just called the doctor and "all circuits are busy" so I'll take that as a very bad sign. Anyway, this morning the three of us were in bed and Addi was coughing all over Sam. I asked her to cover her mouth and she asked why. I said, "You have sick bugs in your mouth and you'll get them on Sam." "Ok, Mommy." Five minutes later: "AHHHHHHHHHHHHHHH!!!!!!!!!!!! I have bugs in my mouth!" 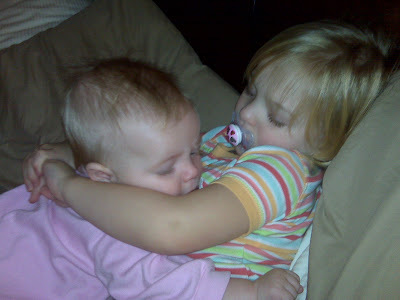 After I calmed her down and then yelled at her for "hugging" Sam (see below), we headed downstairs for some breakfast. I got Addi some orange juice, yogurt and apple slices. And Addi started yelling that now she had bugs in her juice and didn't want to drink it. Bugs that came out of her mouth. I tried again to explain to her that I meant metaphorical bugs, but that's a bit of a hard concept when you are two. So, fine, I'll just drink her juice. And what do you know... There's really a bug in there. Crap.... I see nightmares in her future. And now I've taken five minutes to write this and Addi just fed her yogurt to the dog. This could be a long day.